Cedar Rapids RoughRiders forward Marc McLaughlin has been named the recipient of the 2018 Curt Hammer Award. The United States Hockey League announced today that Cedar Rapids RoughRiders forward Marc McLaughlin has been named the 2018 recipient of the USHL Curt Hammer Award. The Curt Hammer Award has been presented annually since the 1988-89 season and recognizes the USHL player who distinguishes himself both on and off the ice by demonstrating outstanding performance skills, leadership, pride and determination. The award is given in memory of the later Curt Hammer who served as President of the Des Moines Buccaneers for three seasons (1984-87) and also held the role of secretary for the USHL. McLaughlin is the second straight RoughRider to receive the Curt Hammer Award, joining Riese Zmolek, who shared the 2017 Curt Hammer Award with former Bloomington Thunder goaltender Logan Halladay. McLaughlin is in his second year with Cedar Rapids and was named captain by the team earlier this season. 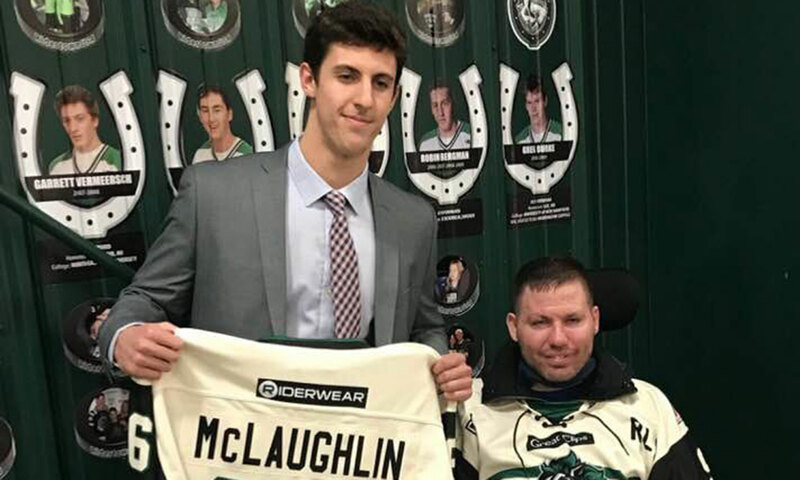 In two years, McLaughlin has become a prominent figure in the Cedar Rapids community, even during this past season when he suffered various injuries. According to RoughRiders head coach Mark Carlson, "Marc's leadership shined even more. Marc was present at every game, practice, weightlifting session and team community service event. He also took part individually or with teammates in various community service events each week" despite the injuries. RoughRiders Community Service Director Tammy Carlson said Marc not only met, but exceeded her expectations through his willingness and desire to coordinate every player’s weekly community appearance as well as work at a nonprofit childcare center every Tuesday and Thursday morning from 7am-9am. He also volunteered weekly at numerous organizations and schools. In addition, Marc helped coordinate the RoughRiders weekly involvement with a Special Olympics basketball program and the Freedom Foundation, where he and members of the team would interact with and feed veterans lunch. He also volunteered at two elderly living centers, interacting and playing games with the residents. Every Wednesday, Marc and other teammates were mentors to students at Harrison Elementary School. In addition, he visited other schools to read to students, educate them on hockey, and visit with the less fortunate. As team captain, Marc was foremost in representing the RoughRiders, including delivering cookies to the police and fire departments thanking them for their services for the Cedar Rapids Booster Club. He coordinated the team's recent fundraiser to benefit the Humboldt Broncos, with RoughRiders players taking four-hour shifts at three area Culver’s restaurants, with 10% of the proceeds going directly to Humboldt Broncos families. The players raised $3,000.00 by working and greeting all the customers, and Marc spoke on behalf of the team and Culver’s at a center ice pregame ceremony honoring the Broncos on Apr. 13. "As Community Service Director, I don’t think there is any other person that could better represent the RoughRiders or the USHL," Tammy Carlson said. "A person with his genuine character does not come around very often. I am a better person for having worked alongside Marc McLaughlin." McLaughlin is a native of North Billerica, MA and is a product of Cushing Academy. He recorded 20 points (10G, 10A) in 21 games in his limited time on the ice due to injury. McLaughlin is committed to Boston College. "There have been very few individuals during my 19 years in Cedar Rapids that have shown such consistent leadership on a daily basis," said RoughRiders head coach and general manager Mark Carlson. "Marc persevered through his injuries to provide passionate leadership to his team every day, even though he couldn’t play. "His presence was felt in the dressing room, on the ice, on the bus and in the Cedar Rapids community at all times. Marc personified what it meant to be a captain, to lead and to inspire." Curt Hammer, a dedicated volunteer and supporter of hockey in the Des Moines community until succumbing to cancer in 1987, was one of the founders of Hart-Hammer, Inc., a commercial heating and air condition ventilation equipment sales firm. The annual USHL award was established to honor his commitment to the League and perseverance he displayed in continuing his work through hockey while battling illness.